Only compatible with Siberian 4.13.16 and above. Price 39€/year subscription. It includes updates and support. 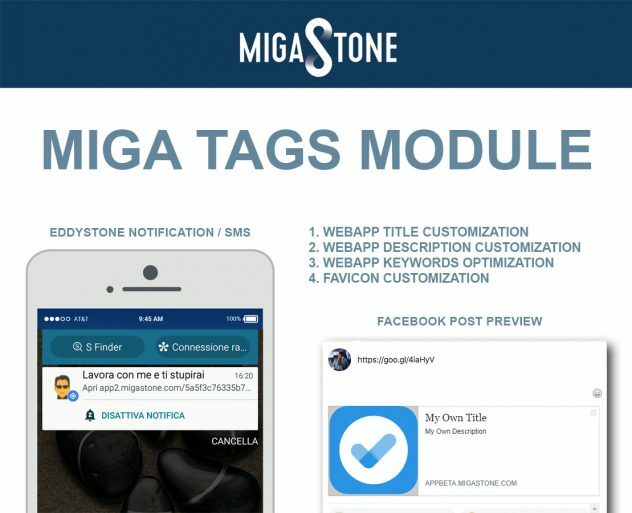 This module is very useful when you try to share the URL of your WEB APP on FACEBOOK, PUSH notifications, BEACONS notifications and all the places where there is a “preview” of the link posted. https://goo.gl/Cq7jb9 just use this link in facebook or whatsapp and you will see the customized title, description etc. The ICON or FAVICON also is very important to be more effective especially with Beacons notifications or SMS. Many phones are creating the preview of the link directly in the SMS view. 2.0.0 Updated shortner provider to bit.ly . Added automatic forwarder to stores if user browse the link with a smartphone.